It was just supposed to be a stopover on the way to the ultra-isolated Pitcairn Island. Mangareva was where my French Polynesia trip would come to an end and I would brace for my encounter with the descendants of the Bounty mutineers in Pitcairn, the most difficult to reach territory in the world. Entering my Mangareva stay, I had already summited a French Polynesian peak, dodged German-eating cannibals, gone wine tasting in a tropical paradise and swam with lots and lots of very friendly sharks. What else is there to do in French Polynesia, other than start my own seastead?? Actually, there is plenty to do — even on the very remote island of Mangareva. 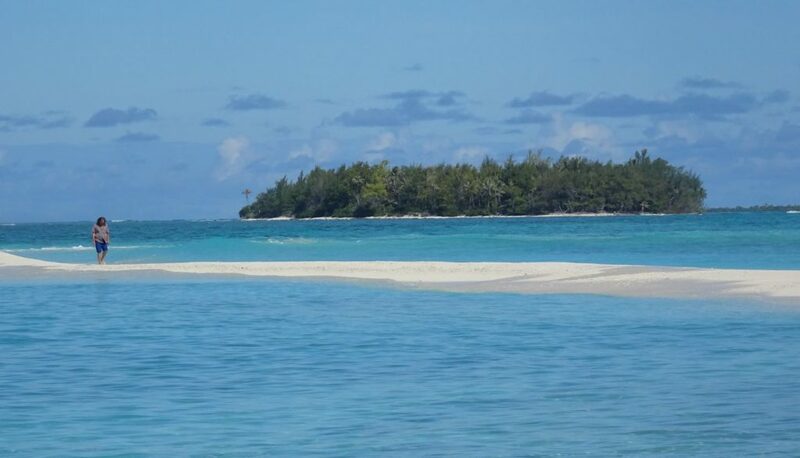 A four-hour flight and brief water taxi ride from Tahiti, Mangareva is the central island of the Gambier Islands, also part of that good old Tuamotu Archipelago (wine tasting, anyone??). Albeit remote and not so large, Mangareva is, in a sense, a combination of the other French Polynesian islands. It has a large lagoon, a green mountain ridge, pristine blue water and coral reefs. Better yet, there are very few tourists on the island with a population of just 1,200. What makes Mangareva stand out among the Polynesian pack is its pearl farms. Mangarevan farmers harvest the most treasured pearls of the South Pacific, pulling them out of oysters and then preparing them for elite jewelers across the globe. Likewise, the island is home to interesting architecture in the form of… churches. 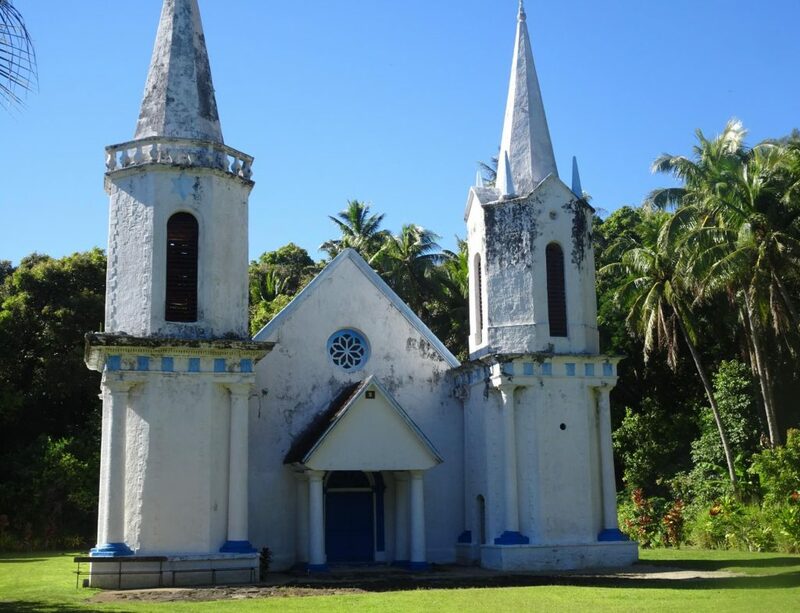 You might not expect it, but Christianity is a thing in French Polynesia. It is the main religion on the islands, and that is especially apparent on Mangareva, where there are spired cathedrals with different shapes and color schemes. One old church I visited is powder blue and white with a backdrop of palm trees… island Christianity in its essence. Upon arriving at the most remote airport (if you can call that narrow strip of land an airport) in French Polynesia, I had one full day to take in Mangareva before departing for Pitcairn. In line with the new regimen I started in Bora Bora, I decided to climb the local peak. 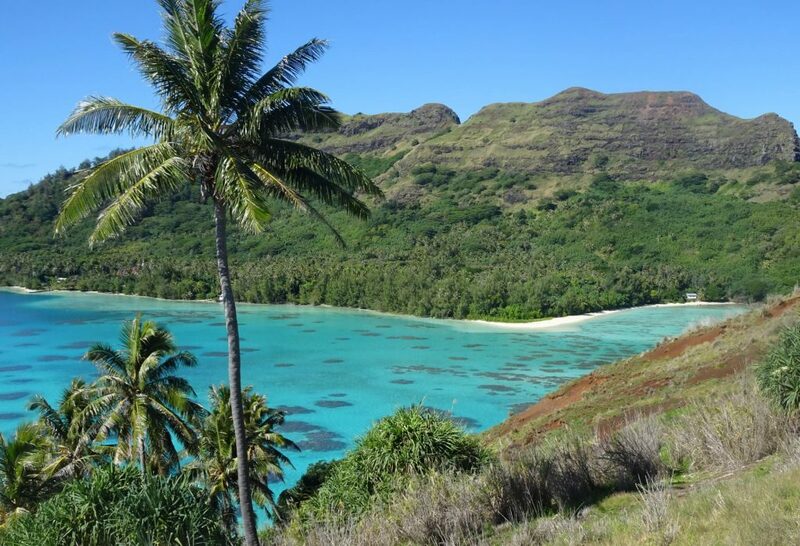 It was a fateful hike — one that would test my gratitude and true appreciation for the wonders of French Polynesia. While climbing the mountain, I was forced to part ways with my honeymoon partner… Actually, I didn’t even bring my laptop with me. But I did manage to destroy my phone, which had been playing the role of the third wheel on my test-run Polynesian honeymoon. Faced with phonebreak at a pivotal moment — neither Mangareva nor Pitcairn is where you want to go phone shopping — I took swift action. I got back into the game. I completed the magnificent hike, took in the views, cleared my mind and then turned to gratitude. Obviously, the islands are beautiful. And the tropical climate is very appealing. The traditional sculptures, like this Tikis, add to the landscape. Throw in some churches and you get an eclectic cultural setting in paradise. The French Polynesian people are special. No one is a stranger in French Polynesia. Everyone speaks to everyone, and from the perspective of an outsider, everyone is incredibly hospitable. Where else do I show up at a vacation rental and the host hands me his car keys? This happened multiple times. On top of the natural and social delights, the perpetual traveler and anarchocapitalist in me gets excited at the lack of taxation on the islands. There are no direct taxes in French Polynesia, except on wages. Unfortunately, it isn’t so easy for most people to reach the islands, and it is even more difficult to immigrate here, unless you are a French citizen. But I am grateful to have traversed this pearl (😉) in the Pacific. And within French Polynesia, Mangareva is certainly a hidden gem. As for my phonebreak, I patched up my love triangle (me, my laptop and my phone). For the time being, I replaced my phone with my camera, giving me all I need to board the MV Claymore for Pitcairn. Camera in hand, I filled my stomach with one final hearty, or rather fruity, Polynesian lunch. And for my dose of Vitamin D, I sunbathed on a thin strip of sand surrounded by tranquil, light blue water. My heart was healed, my body was refreshed and my discovery of the last paradise was complete. I will surely be back in French Polynesia, but now it is off to the island territory that few travelers ever reach. Stay: There are not many options on Mangareva – but the 2 bungalow only Kura Inn is a great one. My host, a local school teacher, was nice as usual, rent me their old car out and gave lots of tips about the islands and organized a great cruise. Really recommendable – and even the internet works. Eat: Time to starve – but at least they have a pizzeria open on weekends. Just go there early though, they sell out quickly. Other than that, sufficiently stocked supermarkets exist. Connect: Mobile Internet had signal, but was hardly usable for anything. Considering its remoteness, Wifi worked sufficiently well and enabled to even upload lots of videos. 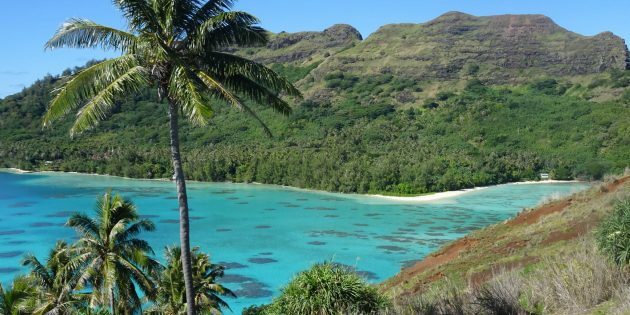 See: Mangareva is easily one of the most beautiful French Polynesian islands. Have a drive all around the island, visit its pearl farms and climb Mount Duff. Do: Dont miss the boat trips to the remoter Gambier islands. The views of the colours of the reef and lush, mountainous islands is just amazing. Go next: Mangareva is the starting points for cruises to Pitcairn with the MV Claymore departing here every 3 months. The sail over there is around 40 hours.